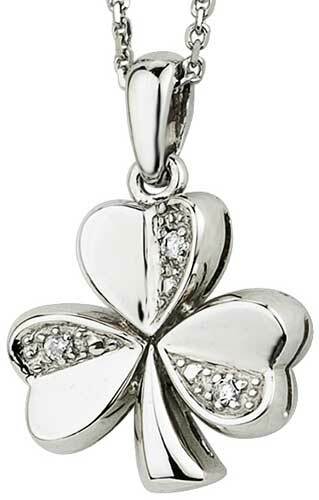 White gold shamrock necklace features diamond accented leaves. This 14K white gold shamrock necklace features leaves that are accented with diamonds that have a 0.024ct total diamond weight. The diamond shamrock necklace measures 1/2" wide x 3/4” tall, including the jump ring and the chain bail, and it includes an 18" long 14K white gold chain. 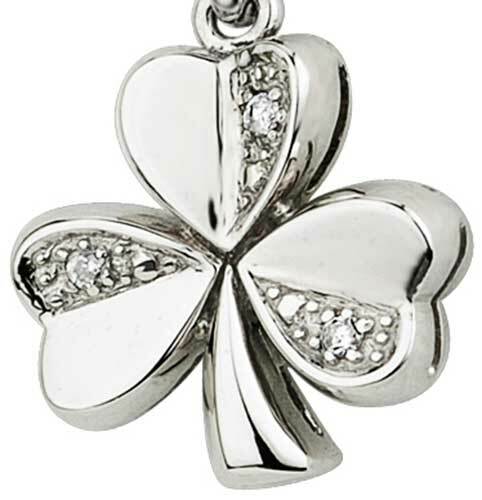 Shamrock necklace features 14K gold construction that is enhanced with diamonds in the white gold accented leaves. Shamrock earrings are 14K gold studs that are enhanced with diamond studded leaves.